One of the indirect benefits of making ends meet on a 1998-era salary in 2010 is that unwanted frugality forces me to be financially intrepid. Since I have so little fun money to toss into the sagging economy following the 20% pay cut I’ve endured since January 2009, I have hit upon a creative way to feed my ravenous theater-loving beast for free by slithering in through the out door when no one is looking … Actually what I really do is not remotely sneaky, I volunteer usher off-Broadway plays. Stuffing Playbills an hour before curtain, then afterward picking up those same Playbills, now discarded, and flipping up seats for five minutes is an easy way to see shows for free. All of my ushering gigs have gone well. Once after I tore a ticket and handed a Playbill to an older woman reeking of wealth, she pressed a dollar bill in my hand. I resisted the urge to return the greenback to her inscribed, “Adopt me.” Another time, following a flat comedy by a revered writer I admire very much, a cluster of older women wearing the fragrance Fort Knox by Chanel, refused to leave their front row center seats and worse, they seemed angry. Since the play was a disappointing stale lump of writing so uncharacteristic of someone so talented, I had the distinct impression that might have been a factor in their exasperated discussion that prominently featured the words awful, horrible and terrible preceded by “that was.” One of the women, who resembled Diana Vreeland cross-bred with Ruth Madoff, called me over. DV meets RM: Has this play been reviewed in the Times yet? Me: No, it’s still in previews. It opens next week. DV meets RM: It should close today. DV meets RM: Did you like this play? DV meets RM: I don’t care about that. (demanding) What did you think of this play? Me (reaching for words): I think it worked, uh, well. DV meets RM: You just lied to my face! Very true, but there’s no way that I’m going to bite the theater company that feeds me free tickets especially when the director, someone extremely prominent on Broadway and off, is sitting in the back row talking urgently to his crew and writing copious notes. 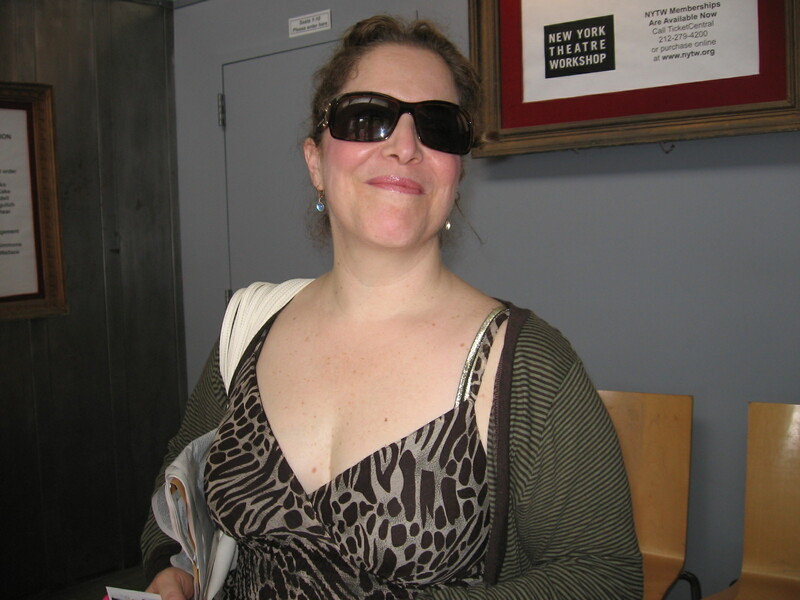 Plus, as mentioned, the writer of that dud of a play is one of my favorite writers. Does Alex Rodriguez hit the ball out of the park in every at-bat? What I really would have liked to have said to DV meets RM is, “Lady, have you ever written a play? Do you have a single solitary clue how hard it is?” Of course, I was mute. 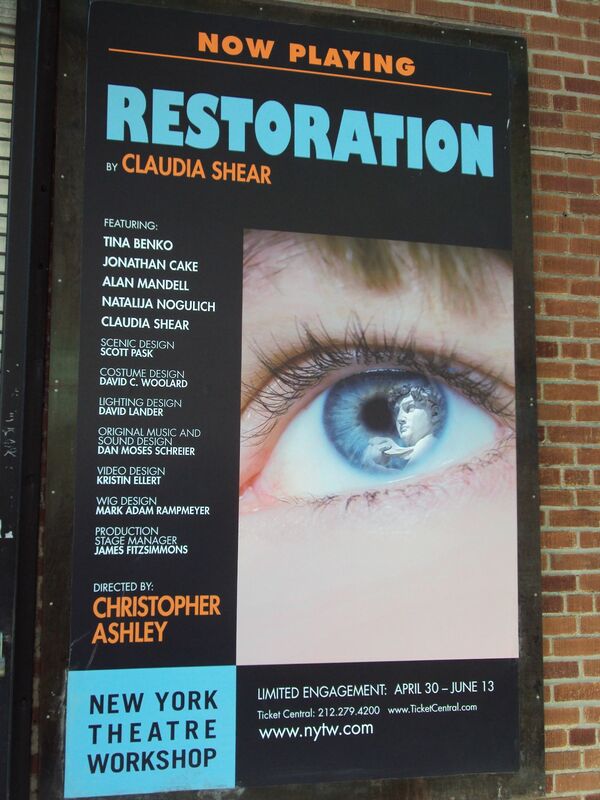 This past Saturday I am happy to admit that I volunteer ushered a genuine gem of a play currently being staged at the New York Theatre Workshop, Restoration, written by and starring the theatrical powerhouse, Claudia Shear. Claudia Shear is someone that if you have a chance to see her on stage, somehow find a way to go. As of now, Restoration closes Sunday, June 13th. It might extend, but it might not. Tickets for Sunday performances are $20 and there is not a bad seat in the house. Restoration is a story about Giulia, a middle-aged almost forgotten art restorer whose smart mouth has nearly killed her career until a former college professor helps her get awarded the rare opportunity to clean Michelangelo’s David. If anything in that description sounds sappy, the play as written and performed by Shear, fortunately, is not. Giulia is quite a jerk but a very empathetic jerk. The story that unfolds is witty, poignant, and by the conclusion, exhilarating. Giulia’s year in Florence working this job of a lifetime is also a time for some serious self-restoration. She battles with the statue’s curators, with her former professor, and most of all with Max, the motor mouthed security guard, who initially irritates hers with his endless musings but over the course of the year becomes a valued friend. At the play’s conclusion, it’s evident that this snarky Brooklynite is going home a better person. Shear so masterfully embodies this self-proclaimed nerd – she even delivers the “please turn off your cell phone” announcement in Italian before the play’s start — it’s easy to share her feelings of accomplishment at the play’s conclusion when the fruit of her year of intense labor is majestically unveiled. Giulia’s proud of herself and the audience is, too. It’s also easy to feel proud of Shear for having massively researched and written such an entertaining play. As spot on as Shear is as the story’s protagonist, she is surrounded by an excellent supporting cast – Alan Mandell as the sage Professor, Tina Benko as Daphne, a cool and beautiful Italian sophisticate as well as Giulia’s nemesis, Natalija Nogulich in three roles – the cleaning lady, the curator and Nonna, a woman who has adored David since childhood, and finally, Jonathan Cake as Max, the witty, charming and heroic security guard. The production design by Scott Pask is off-Broadway at its best with a very imaginative recreation of the actual David statue and museum where it is on display. Christopher Ashley directed this well paced delightful 90-minute production. This entry was posted in Humor and tagged claudia shear, michelangelo's david, new york theatre workshop, restoration. Bookmark the permalink. Inspiring! Want to see this show. A sign of true grandure and grace.